Brand new from Intimina is the Laselle Kegel Routine, a complete pelvic floor workout system in one neat box. 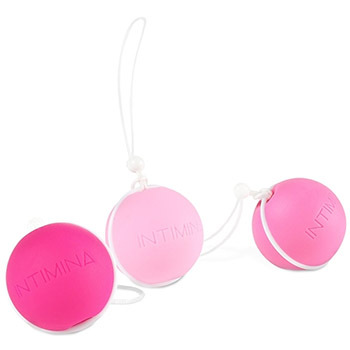 The kit includes 3 weighted Kegel balls, ranging from Light, for complete pelvic floor exercise novices, and those with very weak pelvic floors, through to Higher Resistance for when your pelvic floor is stronger. You can use the balls individually to help you to build pelvic floor strength and tone, or you can use them together for a harder workout as you get stronger. By strengthening your pelvic floor, you will experience greater intimate sensation, reduce the risk of incontinence and help to prepare your pelvic floor for childbirth. It's easy to use and gives quick results.